A storybook ghoul looms just behind a terrified child, dark, claw-fingered arms outstretched to a seemingly impossible wingspan, rising and expanding like a phoenix from the ash, then hanging there, poised to descend, poised to strike, savoring the fear. Fierce, bulging eyes pierce the otherwise enveloping darkness, punctuating its lusty rictus grin of longsaw teeth, frozen on the crudely illustrated page, at least for the moment. The creature had been safely contained on the wrong side of the child’s bedroom door, but it knocked, insistently, some would say maniacally. “Let me in!” it bellowed in the little boy’s imagination, though in reality, all it could ever do was to say, “Ba-ba…dook! Dook! Doooook!” and bang on the door as he retreated under the covers. Heaven help you, little boy, if it ever got in. Heaven help you and your mother. Amelia works a mundane but seemingly rewarding dayshift as a nursing home attendant. Her thoughts occasionally, understandably, drift to the husband she lost six years prior. She wants the best life possible for her young son, Samuel. Sam is, by outward appearances, a typical six-year-old, imaginative, curious, and caring, though prone to acting out, sometimes to the point of violent fits. The two bond watching TV together, and Amelia overcompensates to soothe and reengage him in the aftermath of his occasional episodes. She has little regard and no patience for officials who single Sam’s behavior out as aberrant or potentially dangerous. While Amelia cooks dinner upstairs, Sam can often be found in the basement – his late father’s domain, untouched and still teeming with mementos – practicing rudimentary magic tricks and talking to, well, the air. Or is there something there? Sam seems consumed with protecting himself and his mother against the imaginary monster that haunts him, and he and Amelia spend a dependable portion of each night illuminating dark closets and dutifully checking under the bed. Nothing there, on this night or any other, yet Sam’s behavior grows increasingly irrational and upsetting. One night, he asks his mother to read him a children’s book she’s never seen before. “Mister Babadook”, reads its cover, rough black lettering against a blood red background, with a squat, ominous silhouette at the bottom. Against her better judgment, she fatefully begins reading to Sam. Jennifer Kent’s revelatory The Babadook isn’t interested in redefining fear for a new age. Its story, of an Australian widow’s frantic defense, at the expense of her own sanity, of her troubled six-year-old against a storybook demon made manifest, already plays on any number of established phobias, including: the parent’s all-encompassing concern for her child’s welfare, loss of control, loss of normalcy, fear of being ostracized from a family, or a community, and, on an even more elemental level, fear of the unknown, fear of intruders, fear of monsters, and, finally, fear of the dark, and what might be lurking there. Though hardly great fun by any normal definition, it is skillfully made and tremendously, almost hypnotically, involving, that rare modern horror movie to work on and draw from the planes of the supernatural and the psychological with equal craft and cunning. The film treats its characters and plot with the utmost respect and near crushing gravity, which, while oppressive, should only seem truly excessive if you were never, ever a child gripped with fear of the sadistic thing hiding in the darkest nooks and crannies of your bedroom. The Babadook‘s approach is to disorient and unsettle parent and child alike, wearing down its protagonists and audience simultaneously. While there’s no such thing as a uniform response, to many viewers, it will be well and truly terrifying. It got to me. Counter to everything she knows and trusts is real, Amelia witnesses the toothy blackness at the heart of Sam’s book unmistakably spilling out into and poisoning their lives. It scratches, it pounds, and it brays. It crawls across her ceiling. It lurks beneath her bed. Something awful and fantastic is going on inside this house. By the film’s midpoint, there literally is almost nothing going on outside it. It is an isolated, self-contained space, cast in flat blues and dull grays, drab, workmanlike, and bereft of luxury. Every corner visible is a dramatically dark corner. The only light by night is moonlight, insufficient to illuminate anything much besides further defining those forbidding black spaces in the backs of bedrooms, beyond which might lie a yawning abyss for all Amelia or Sam know, or imagine. Indeed, while experiencing The Babadook, the audience’s imagination works overtime with minimal prompting. This is an underrated but invaluable element shared by a surprising lot of the greatest horror movies of all time*. Very few blanks are filled in for the viewer, who is forced, in their absence, to invent them. Writer/director Kent keeps her focus both locked and limited throughout, and her movie lurches suddenly forward in fits and starts, drawing out the intervening lulls and marinating in them, giving Amelia ample time to ponder what is happening to her and her son, and her futile attempts to resist. This stuttery pacing has the effect of making the Babadook’s visceral impact on both the family and the viewer greater than might be delivered by a more diligently or professionally oiled machine. What is a reasonable response, after all, for the frayed mother, keeping an insomniac’s vigil, her child sleeping restlessly beside her, who, in the dead of night, hears three sharp, booming knocks at her door, steels herself to open it, and finds nothing, except to slowly go mad? Who is to say the doorway will be empty next time? *The two that sprang to mind for me were Robert Wise’s “The Haunting” and Stanley Kubrick’s “The Shining”. This scenario is lifted, practically wholesale, from any number of “troubled child in danger” horror movies over the years, of course, though vanishingly few of those, at least the ones I can summon from memory, ever approached this thrumming level of effectiveness. Much of the film’s power can be attributed to its two central performances, which are distinguished even in the annals of “unhinged mother” and “hysterical child” history, unmannered and (comparatively) naturalistic to the point that – somewhat ironically for horror fans forever in search of realism – they’re almost a distraction. Essie Davis plays Amelia as an overwhelmed, emotionally marooned survivor of post-traumatic stress (her husband died in a car wreck driving her to the hospital for childbirth) whose role as a mother has subsumed the rest of her life. She tries desperately to manage and understand her son’s outbursts, to decreasing avail, and exhausts all other possibilities before finally entertaining, and grudgingly accepting, the fact that something implacable and otherworldly is at play. Noah Wiseman, as Samuel, gives one of the most compelling child performances I’ve seen. At no point does the viewer ever tire of or resent Sam (not insignificant feelings to point toward a horror movie kid), discount him, or doubt his sincerity, whether he’s lashing out or thrashing about, playing innocently or laughing like the little boy he is, frozen in mortal fear of the Babadook or seeking in his child’s way to fight it, or cuddling, exhausted and blessedly asleep, with his mother, the comforter of her bed, beneath which one can always duck his head, a last ditch ward against its increasingly pervasive evil presence. Sam is the only one of the two asleep, however. Eventually, you must to pull the cover back from your eyes and gaze on the real world again. Sometimes, as it turns out, nothing is there. But only sometimes. The Babadook’s titular menace works so well in large part because it is thoroughly described but never explained. By rights, such a malevolent creature should defy explanation. Like the great white in Jaws or the xenomorph in Alien, or like bogeyman made flesh Michael Myers in Halloween (at least before he turned druid, or the 2007 reboot [Rob] Zombie-fied him beyond recognition), Mister Babadook is simply a fact of life. The fiend’s conceptual introduction in the children’s book Sam has his mother read, some twenty minutes into the film, is one of the most marvelously constructed, subtly bone-chilling sequences in recent horror memory. “If it’s in a word,” the book begins, “or in a look…you can’t get rid of The Babadook.” Amelia is immediately uneasy, but presses on. “This is what he wears on top,” the narrator sings, referencing the bug-eyed monster’s stovepipe hat. ** “He’s funny, don’t you think?” Amelia, unsettled, stops reading aloud soon enough but, tellingly, still pushes forward. Her worried face alternates with urgent close-ups of the pages as they flit by, stark black and white nightmare fuel for young and old alike, though written in verse clearly intended for the former. We the audience are now compulsively reading along as the book escalates, attendees if not quite participants in a grand, macabre debut. 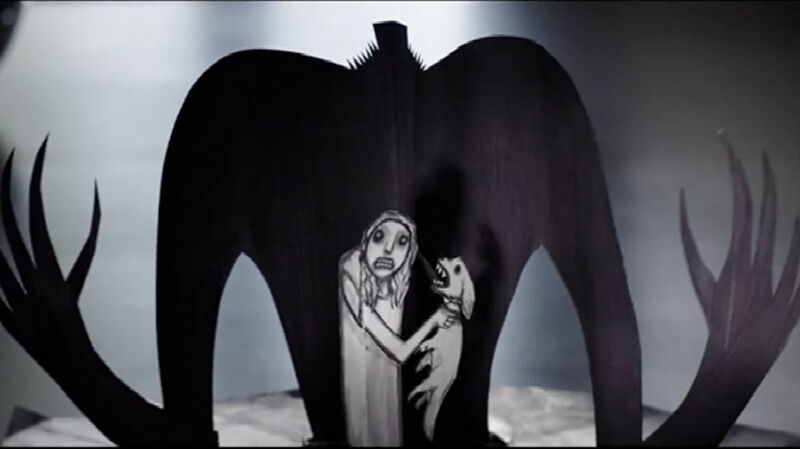 The Babadook, a nebulous figure seemingly concocted out of shadows and teeth, is shown terrorizing a woman and a little boy. “I’ll soon take off my funny disguise,” it baldly threatens. “Take heed of what you’ve read.” When next we see Amelia and Sam, she is trying in vain to soothe him with a standard fairy tale of the “happily ever after” variety. She later hides the book, then attempts to destroy it. A fraught, sleepless night and three sharp knocks at the door later, she finds a present awaiting, only her latest of many unwelcome discoveries. **There’s a visual debt here to the eponymous good doctor from German silent horror pioneer “The Cabinet of Dr. Caligari” (1920), which, upon further review, also provides pretty obvious inspiration for the exaggerated angular darkness of the picture book’s incredibly vivid illustrations. The best have guts enough to borrow from the classics. Regardless of age, no one is immune to his or her own occasional anxious moments in the dark, nor particularly ill-equipped to envision what the awful unseen might look like once it finally, terribly, steps into the light. Adults at least instinctively internalize the primacy of their position and role as the protector of children. So it turns out that the most awful card the film has to play stems from a bit of behavioral misdirection that Kent doesn’t so much spring on her audience as tacitly encourage it to write themselves. “You start to change when I get in,” cooed the bookbound Babadook, and, after one too many sleepless nights, it turns out the Amelia that enters the final confrontation is, indeed, vastly different than the one we’ve come to know and support. We began the film concerned for Sam, who recognized the evil presence immediately and, despite his own fear, only ever really professed to wanting to protect his mother. We end it horrified for him. Sam has remained relatively untouched, but his worst fears have been realized nonetheless. Amelia and Sam are so relatable, and the Babadook conceit so potent and insidious, that the audience finds itself simultaneously in a heightened, almost free-flowing, state of imagination but with its practical defenses, sapped through exhausting repeated close encounters ’round bedtime, dangerously low. This state affords Kent the perfect leeway to spring whatever deviltry she might see fit, and, as a device for creating fear, works infinitely better than the modern strategy of carpet-bombing under-realized simpletons with jump scares ever does. The Babadook purrs, but isn’t quite perfect. As with most horror monsters, Mister Babadook is 100% scarier when urgently suggested than when eventually standing before you in the flesh. The climactic confrontation and aftermath are also both a little too messy and odd for my tastes, though Amelia and Sam earn every bit of the ending Kent has devised for them. But can they ever truly close the book? I loved this film, so much. Great review. I did a write up for it as well. It’s so good that it makes me want to immediately program a weekend of modern horror to watch at home, though there’s no way to expect that same kind of quality across the board. The Babadook is a very rare beast. Thanks much for reading, and for the kind words!